On Saturday, March 16th, Alachua Conservation Trust (ACT) will host its 20th Annual Conservation Stewards Awards at Prairie Creek Lodge, and you are invited to join us in the festivities! Each year, this event honors individuals in our community who are influential in a wide variety of ways – the arts, historic preservation, and particularly, in protecting our wildlife and natural resources. The Conservation Stewards Awards is one of the largest gatherings of community leaders and supporters of wild Florida in the region. The event features a cocktail hour, dinner, an awards ceremony and live music. With over 450 guests and extensive news media coverage, you don’t want to miss Florida’s biggest conservation event of the year! 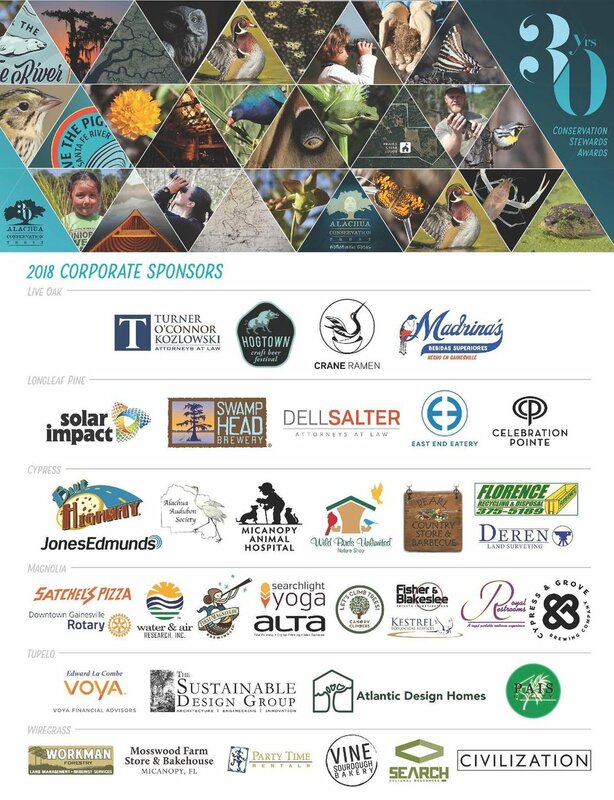 On Saturday, March 16th, Alachua Conservation Trust (ACT) will host its 20th Annual Conservation Stewards Awards at Prairie Creek Lodge, and you are invited to join us in the festivities. This year’s theme celebrates the diversity of Alachua Conservation Trust’s work across counties, landscapes, and communities. Counties: Since its incorporation in 1988, ACT has helped preserve more than 53,000 acres of land in 16 counties throughout north central Florida, directly participating in the purchase of over 19,700 of those acres, and opening up 11 public preserves. Landscapes: Thanks to our supporters, ACT has been able to provide access to native landscapes that we restore through annual prescribed fire, longleaf pine planting, and managing for local wildlife. Communities: ACT also brings connection to wild Florida through our robust natural resource internship program, Women in the Woods, as well as nonprofit operations internships, advocacy and awareness through the Springs Eternal Project, volunteering workdays, Tuscawilla Learning Center’s environmental education programs, preserve clean ups, and our Springs Ambassadors and Young Leaders of Wild Florida youth camps. We love our Corporate Sponsors! They are the reason Florida stays wild and wonderful. All Corporate Sponsors receive perks for joining us in partnership. Each level can be reached by traditional donation or through in-kind goods or services. Please contact our Community Outreach Coordinator, Melissa Hill at act.melissah@gmail.com for more information regarding corporate sponsorship opportunities. Tickets to win a canoe handmade by master craftsman and avid ACT supporter Bruce Proctor are available for $20 a ticket. You do not have to be present to win. The canoe’s hull is made from beautiful Western Red Cedar strips and the remaining woodwork is made from locally milled cherry. The canoe is 18.5' long, 37" wide, and weighs 79.5 lbs. The winner will be chosen at the Conservation Stewards Awards on Saturday, March 16th. All proceeds raised will be donated to ACT programs and projects. Tickets can be purchased in advance below, or in person.